Moving on from the previous sessions we are still using the formed sub teams with pipeline method as it seems to have been a more effective way of working that everyone is happy with to move forward on. That being said in these 2 sessions its just been a case of Myself, Phil and James to manage, task and check our teams to produce work and improve the quality of that work. To do this we had a sub team leader meeting outside to check what needs to be done still in the process so that we can realistically set a goal for each section of the project. That being said it looked like we had a lot of work to do and based on a working day (8am-8pm) there was little room for the whole project to be finished like we had wanted initially with the indoor market, Ye Olde White Harte and lots of vehicles. This is disappointing but as long as we can focus and create the rest of the area in the remaining time the project would still be meeting our initial primary and secondary goals the only things we are hitting short on are the tertiary goals which is a shame but priorities must be made in relation to other work the group needs to do. My team personally has been tasked Land of Green Ginger, Silver Street, Trinity House Lane and Bowlalley Lane by the end of the project. This will include assets in the area of them streets. The idea behind this was to give a section of a street to each member of my team so not only do we have a progressing street each person should have a portfolio piece of 3D work. This would then be passed onto a texture team member to texture a section for a portfolio piece. Moving on from that everyone had to get on with what they have been tasked so that we can meet these objectives. We then was asked to sit down as a group to focus to pin down a name for the project. To warm up for this we did a word then say a word in relation to the previous word exercise, for example I say street, someone says buildings. 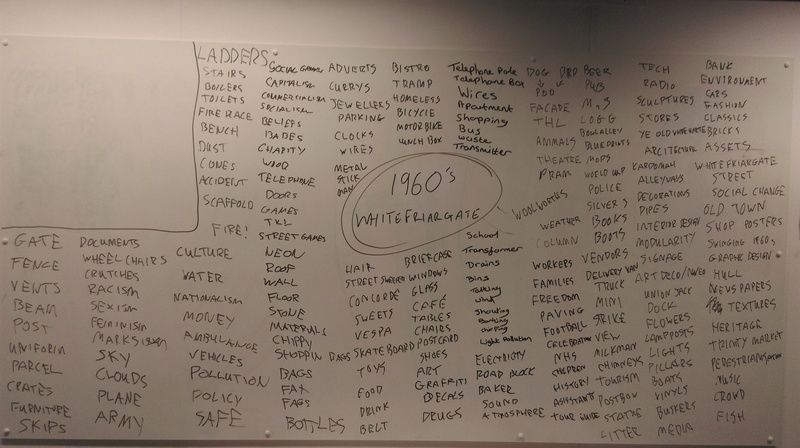 We did this generally at first so anything random to get us going and then moved onto just words in relation to an overall theme of 1960’s Whitefriargate. Many names were thrown out trying to piece together something. Some of the favourites we pinned down was my idea and favourite “Old Town Memories”, “Memories of Old”, “Ye Olde Memories”, “Treasures of Hull” and “Lights of the Past”. I quickly shot down the “Ye Olde Memories” due to it suggesting its of a time way before 1960’s most liked it and it sounded good but the inaccuracy of it in relation to our time period suggests the project is something different than what we have done. The use of “memories” that i suggested seemed to be a popular word but it was just piecing it with other words as despite having a section of Old town some suggested that it may make the public believe we have the entirety of Old Town which is way past our section. With all that being pinned down we said lets have over Easter to think on it as some name may come up in that time we all like better so it isnt a rushed decision. We will pin down a name on the first session back. Into session 19 it was a case of everyone continue with what they had been doing and then at the end of the session team leaders would go check if tasks had been met from the previous week, unfortunately most was half done i could see progress had been made but it wasn’t as fast as had hoped. 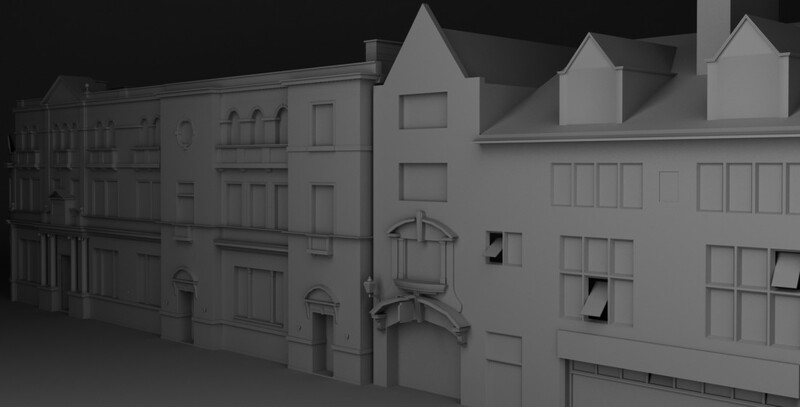 Nevertheless i set them to finish their street sections by the time we return in 2 weeks after Easter and Viktor to finish his sculpts for the clothing, character and certain building sculpts. With all that being said myself and Phil then got pulled from the client project for the Easter holidays by Paul our tutor due to our major contribution to most of the client work in comparison to some others, this allowed us to focus on our self initiated work over the Easter period which had been neglected for our roles in the client. Its all very minimal, certain features that are permanent like the gun still have a slight transparency so its not drawing your eye away too much unless you need to look there. The main feature we like is in this video when he kills an enemy or finds an item it appears on the right in a box with a little icon of the item found then disappears, to link this to our project we are doing a treasure hunt mechanic so we could use this to show the player they have found a jar of sweets then it disappears, if they need to see what they have collected and how far they are off the target we could use an inventory system to show up on a button press. To follow from his presentation he put some images of his work on base camp for critique, i proceeded to give him feedback on this work suggesting his current designs were rather bold and didn’t blend well with the environment, it needed more subtlety to work i suggested researching into fashionable colours of the time so it had some relevance to the period then trying the destiny style minimal approach. All this being said Easter is no time off for the others work for this project needs to be done. I personally think we should really go for this at the end of it we show it to the public with our names on it, i don’t want a poor end product to be showcased as its a bit demoralizing considering how much work has been put in. This will all take a design process and we shall decide who takes this after Easter once the name is pinned down properly.